Hair and Beauty Hub Stamford Hair and Beauty Hub Stamford provide their clients with high-end brands such as Bumble and bumble, Wella, Global keratin, Dermalogica, Artistic Colour gloss polish, Skinny Tan and LVL lashes. All our Stylists and Therapists are highly trained in the use and application of our products and aim to educate clients about their own specific needs, whilst recommending which products can fulfil these requirements. 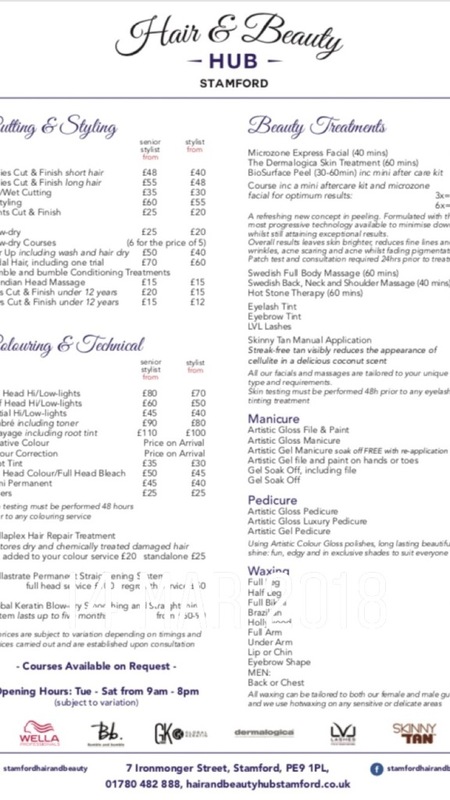 Hair and Beauty Hub is Stamford's newest premier hair and beauty salon, situated at 7 Ironmonger St, Stamford PE9 1PL. Francesca has been operating her own exceptional salons in the Northcote Road area of Clapham and Battersea, London for the over 10 years. Having already moved to Stamford, the opportunity to renovate a beautiful building on Ironmonger Street presented itself. We are currently Seeking a qualified hair stylist to join our team.